Our rates are the same year round, and we never raise our rates to take advantage of holidays or "high season". Note: we do not recommend our rooms situated along the deck for families with small children since our terrace is situated about 10 metres above the rocks along the river. Only the Baan, Nests or Rice Hut are suitable for small children. Our newest accommodations are The Nests. Located in a natural red-earth masonry structure high on our property and looking down towards the river over our gardens, The Nests offer our most comfortable and well-furnished living space - modern but in a traditional style. They are air-conditioned and appointed with high-quality, custom crafted solid teak furniture that we designed ourselves, as well as modern electronic conveniences such as satellite LCD TVs, DVD player, wifi and an iPhone docking clock radio unit. We have complimentary coffee and tea in the Nest rooms. The rate for each Nest is 1600 baht/night, or if you would like the whole building with both rooms and the roof terrace, the rate is 3200 baht/night. 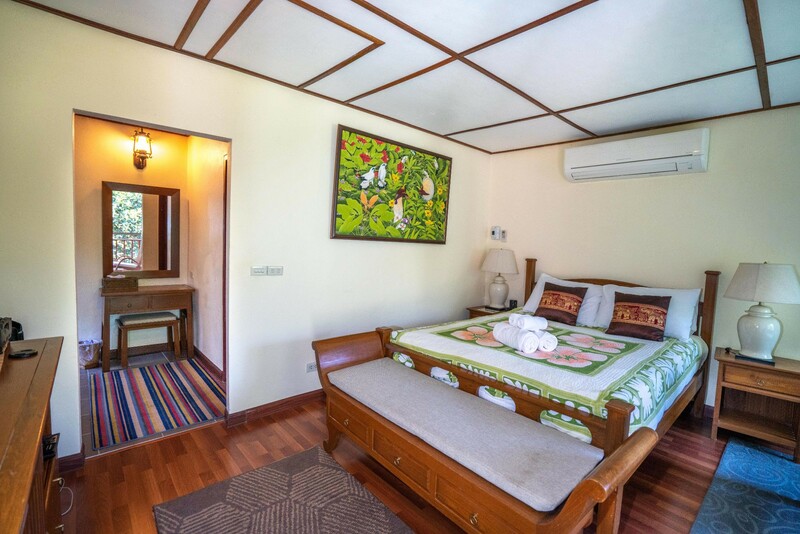 The Champa Room is adjacent to our river deck and is sort of our "junior suite", with all teak furniture, a four-poster king size bed, a convertible sleeper sofa in a sitting area, complimentary coffee and tea service, and an LCD TV with DVD player. You can borrow as many films as you like from our large DVD lending library. There is one king size teak poster bed and of course an ensuite bathroom with gas hot water. There are also 100% cotton bathrobes and slippers for your use. Champa has air conditioning, although you will rarely need that in Soppong. The rate is 1300 baht/night. With a treetop view over the river from its upstairs deck is the Leelawadi Cottage. 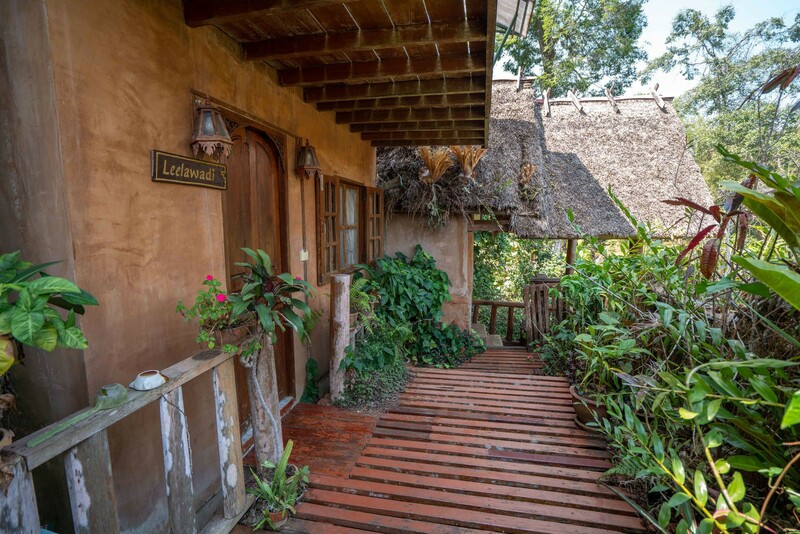 Leelawadi is a cozy two-story cottage finished on the outside with natural, local red earth stucco. Downstairs, there is a rattan and wicker sofa, table and chairs along with a refrigerator and television with DVD player, and complimentary coffee and tea service. The open-style bathroom features halogen lighting, a hand made ceramic sink set into a teak counter and a gas hot water shower space. The teak spiral staircase leads upstairs to the sleeping quarters with a queen size bed and locally handcrafted teak frame. There is also a rattan wardrobe and inside you will find 100% cotton bathrobes for your use. 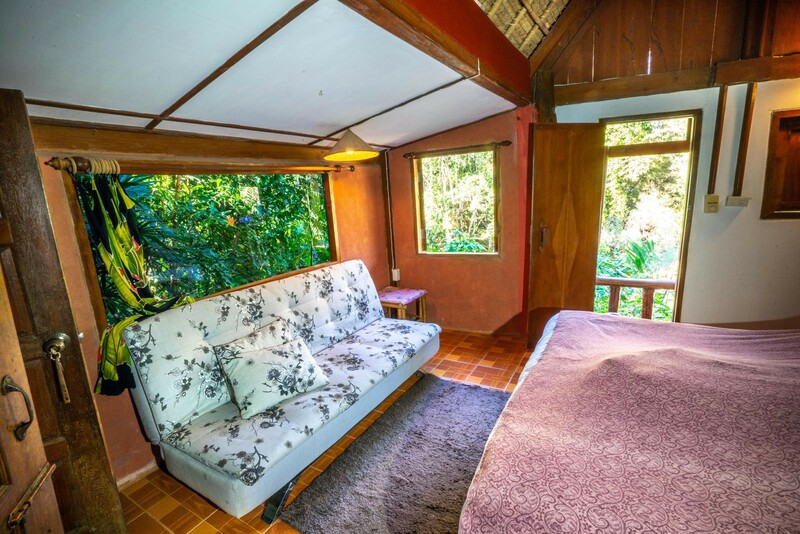 The upstairs door opens to a small private deck with a view about 15 metres down to the river and across to the protected national forest jungle. 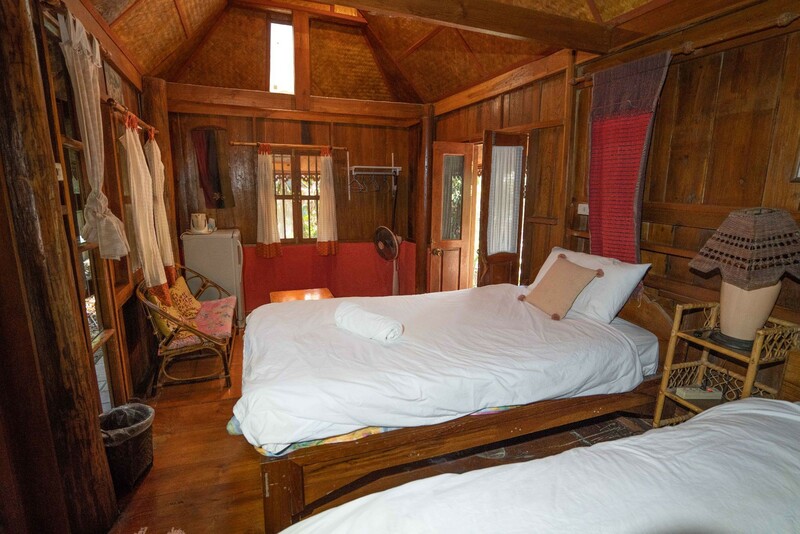 The rate for the Leelawadi Cottage is 1200 baht/night. The Bamboo Rooms (two of them) are located on the deck near the river. Constructed using teak and with bamboo plywood interior, these rooms are spacious and incorporate a twin-tiered roof and ceiling, inspired by the local Shan temple architecture. Along with the brass and rattan ceiling fans, the roof design allows for fresh air and good cooling. As with all our rooms, the bamboo rooms have comfortable queen-size real mattresses (a rarity in remote Thai villages like Soppong) with Thai style decorations, table and chairs. Ensuite bathrooms, constructed of ceramic tile, masonry and glass brick, have western style toilets, hand-made ceramic bowl sinks set in teak, and gas hot water showers. The Bamboo Rooms are also equipped with refrigerators. The Bamboo Room rate is 700 baht/night. The rustic River Rim Cottage, constructed of teak, stone and masonry with a private 'open-sky' gas water shower bathroom, a queen size bed and a refrigerator - all perched above the river. There is also a private verandah overlooking a 10-metre drop down to the river...perfect for birdwatching in the early morning. 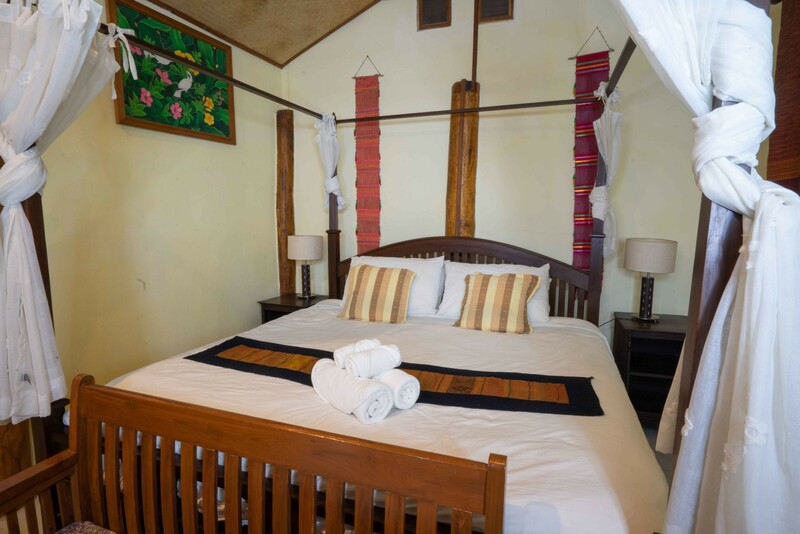 The high and open Indonesian style thatched roof, along with the ceiling fan, keeps this room nice and cool. The rate for the River Rim Cottage is 1200 baht/night. The Chaba rooms. We have two cosy rooms set back from the river in a quiet part of the property. 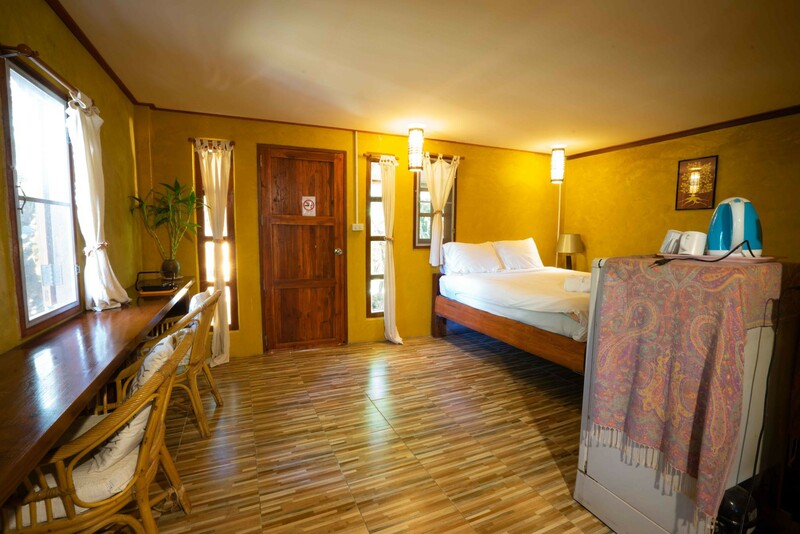 Both rooms have fan cooling, hot showers and Chaba 1 has a refrigerator and spacious living area. Room rate for Chaba 1 is 700 baht. 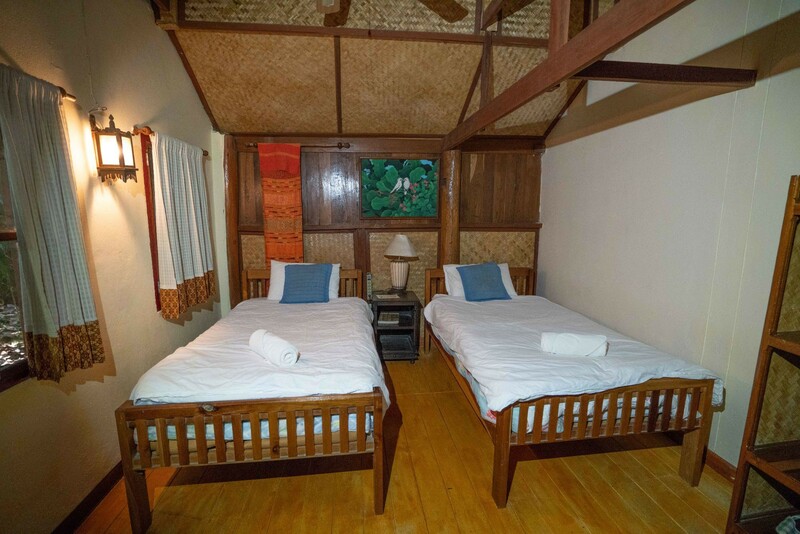 Chaba 2 is a smaller room, also with an ensuite. Rate is 500 baht/night. The teakwood Rice Hut is a cozy cottage modeled after the rice storage houses used in Northern Thailand. It's located away from the river, by itself, at the top of our property and closer to the road, with an adjacent parking space. The en-suite bathroom is constructed of Thai style ceramic tile and glass brick, with a western toilet and gas hot water shower. There are also wicker table, chairs, lamps, TV with DVD player and a refrigerator. A brass and rattan ceiling fan keeps things cool. The Rice Hut rate is 500 baht/night. If you would like to experience staying in a traditional Northern Thai teak house, The Baan is available. Our largest accommodation in terms of space (45 sqm), it includes one queen and one single size bed, wicker sofa and chairs in the living space, refrigerator, coffee/tea service, television with satellite channels and DVD. There is a modern western bathroom with a gas hot water shower. While The Baan is not directly on the river, it has privacy and is set back away from all the other rooms, thus creating an authentic northern Thai living experience, but with a touch of luxury. The nightly rate for The Baan is 1200 baht/night. We also have special monthly rates since some guests have rented The Baan for long term stays. And with any of our rooms, if you stay with us for six nights, your seventh night is always free. Just one more thing – you know how hard the beds always seem to be at guesthouses in Thailand? We noticed that too and rock hard beds are not our thing. That's why we spend a bit more on our beds and use all cotton linens so that you can have a nice, comfy sleep. Western or Thai breakfast is served each morning in our Seven Elephants Café. All breakfasts come with a fresh in-season tropical fruit salad, your choice of American (eggs your way with bacon or our own homemade patty sausage, tomatoes & whole wheat toast), European (muesli with milk or yoghurt and fruit), or Thai (breakfast noodle soup or hot rice porridge). All set breakfasts come with your choice of fresh ground espresso, coffee, or a pot of western, local, organically grown tea. The price is 130 baht, and breakfast is available until 10 am. Our licensed Cafe, with a selection of local beer and international wines, is also open for lunch and dinner with an extensive choice of Western, Thai and Shan food available. We use the finest and freshest ingredients in all of our meals.